Kdan Mobile Software, a leading software developer, is holding the 2012 Christmas Lucky Draw event from December 20 to December 27, 2012. The Company plans to promote customer engagement and give away an iPad mini and other great prizes to its supporters. 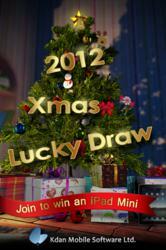 Kdan Mobile, a leading software developer, is holding the 2012 Christmas Lucky Draw event to celebrate the holiday season. The event, which runs from December 20 to December 27, 2012, invites all to join the lucky draw and stand a chance to win an iPad mini and other great prizes the Company has to offer. To take part in the event, participants have to visit the event page, which features a Christmas poster with hidden prizes. According to the Company, they have prepared a variety of prizes to surprise the participant everyday. “The event is designed to spread the festivity and celebrate the season of sharing,” said Chris Su, Product Design Director of Kdan Mobile. The event allows each participant to join the Lucky Draw once per day during the event period. Kdan Mobile will update the list of winners and prizes on their Facebook fan page daily. “The lucky draw offers a great opportunity for us to interact with our growing users and reward our fans,” remarked Kenny Su, CEO of Kdan Mobile. “We would like to take the chance to express appreciation to the patronage of our supporters,” continued Su. Su promised that the Company will keep developing world class products that allow users to experience the convenience brought by the state-of-the-art technology.